I have to be honest. 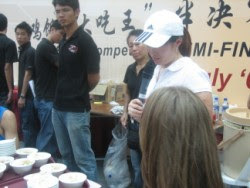 I always disliked all kind of eating/drinking competitions regardless what charity they were supporting and regardless the food they were using. 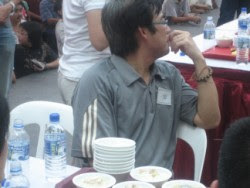 Chicken rice (Singapore/Hongkong), Hot Dogs (USA), Sushi (Japan), Beer gulping contests (Germany) and so forth. 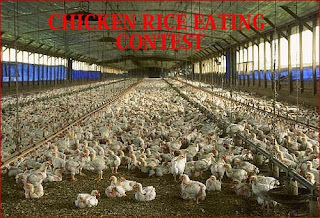 Apologies to the organizers of the Chicken Rice contest in Chinatown, especially to Jennifer, who did a great job, but I just have to say it's disgusting. Probably my own and humble opinion but I can't help it, it doesn't make any sense to me. Many of you don't know it but I was very close to participate, the 1st time in my life. 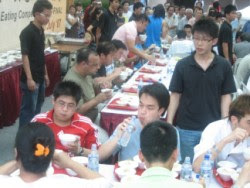 No, I didn't throw my conviction over board, I was persuaded (for charity reasons only) by some friends and secretly enrolled to this Chicken Rice Eating Competition. Well there's always a first time, so I went there ahead of my scheduled starting time, thank god! Because I was able to watch the 1st elimination round and that was when I literally "chickened" out. 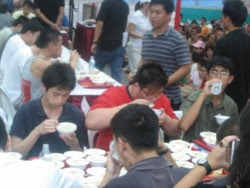 My expectation was to go there finish slowly one bowl for charity and let others win the first price of SGD 2000. After all I beg the organizers to think about such competition, probably organize some fun events for the upcoming years and drop competitions that encourage people to disgustingly gulp extensive amounts of food. However if people really like this kind of contest then be it. 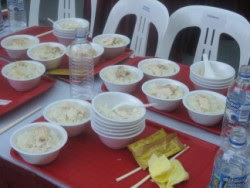 Despite the eating contest Chicken rice is one of Singapore’s yummy signature dishes which is definitely worth trying. There are a few stalls in Chinatown, around the Wuerstelstand serving it and of course hundreds all over Singapore. I myself went to Erich and enjoyed his delicious meat loaf in a bun (Leberkaessemmel) with gherkin and Erdinger beer without having to beat the stopwatch.